The rotation is led by a dominant one-two punch in Ian Kennedy and Daniel Hudson. Both right-handers have established career-highs in wins this season with 10 each. Left-hander Joe Saunders has rebounded from a slow start to serve as a reliable third starter. In his final nine starts prior to the All-Star break, Saunders posted a 6-2 record with a 2.85 ERA. He pitched six or more innings in eight of those outings. The emergence of rookie Josh Collmenter has also provided a boost. After starting his Major League career in the bullpen, Collmenter slid into the rotation in mid May. Overall, he’s been a solid new addition. The right-hander is 5-5 this season, but owns a 2.65 ERA in 19 appearances. The fifth and final slot in the starting five has provided mixed results. The return of a rejuvenated Barry Enright is expected to pay dividends. Enright made a name for himself last summer after being called up from Double-A Mobile. He won his debut on June 30, and then surrendered three earned runs or less in 12 consecutive starts. After a rough beginning to the 2011 campaign, Enright headed to Triple-A Reno where he went 8-2 with a 4.29 ERA in 12 starts. As the National League West division race heats up, pitching will undoubtedly play a vital role down the stretch. Here’s a look at three standout performances by three of Arizona’s starting pitchers. 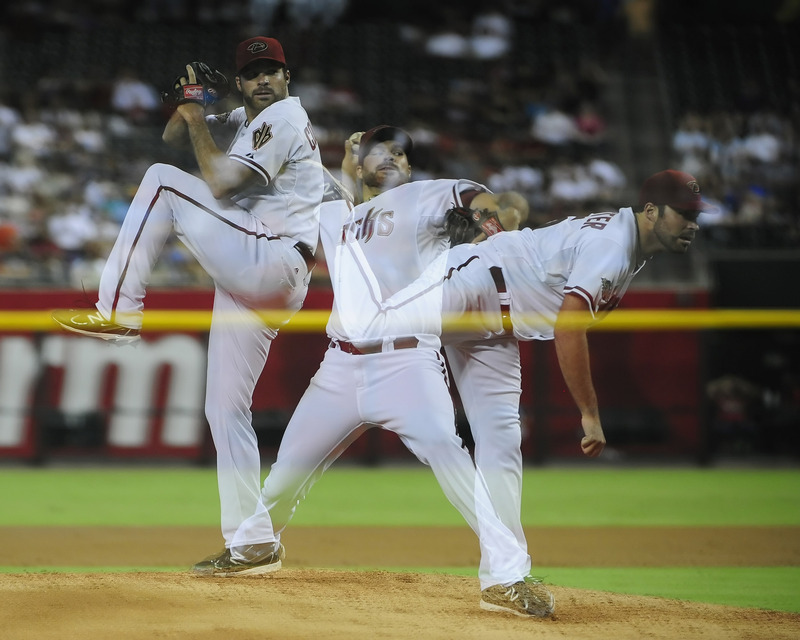 Like he’s done all season long, Kennedy pitched deep into the ballgame and put the D-backs in a position to win. He fanned seven Dodger batters and overcame a rocky fifth inning in which he walked three batters. It was yet another gutsy performance for the second-year D-back. Kennedy is now 10-3 with a solid 3.39 ERA. He’s pitched six or more innings in 16 of his 20 starts this season. Hudson did it all in his 20th start of the season. In addition to unleashing his second-career complete game, he provided plenty of offense at the plate. Hudson smacked his first-career home run, a solo shot in the bottom of the sixth. He struck again in the seventh, when he laced a two-run single into left field. The hard-hitting pitcher is now batting .359 with 12 RBI this season. Hudson was just as stellar on the mound. He collected 1-2-3 innings in the first three frames before allowing a bunt single in the fourth. In the fifth, Hudson escaped the Los Angeles threat by inducing Rod Barajas and Ted Lilly into groundouts. Hudson finished off the Dodgers with a 1-2-3 top of the ninth to close out the 4-1 D-backs win. Following two extraordinary outings from Kennedy and Hudson, it was Collmenter’s turn to stifle an opposing offense. He did just that in the series opener against Milwaukee. In what was perhaps the most notable start of his young career, Collmenter delivered eight shutout innings while scattering just three hits and walking none. He retired the side in order for four consecutive innings and struck out seven Brewer batters.